ONCE I THOUGHT THAT ANTI-SEMITISM HAD ENDED; TODAY IT IS CLEAR TO ME THAT IT WILL PROBABLY NEVER END. Below is information to keep in mind when teaching the content in this unit. This material is intended to help teachers consider the complexities of teaching about contemporary antisemitism and to deliver accurate and sensitive instruction. When teaching about the Holocaust, it is essential to introduce students to the concept of antisemitism. The Antisemitism unit provides important context to understanding how the Holocaust could happen and delves into related concepts of propaganda, stereotypes, and scapegoating. Introducing students to contemporary antisemitism will likely expose them to new and unique themes, including the demonization of Israel and its leaders. It is important to recognize that Israel, as any other democracy, can and should be receptive to fair and legitimate criticism; however, condemnations of Israel can cross the line from valid criticism into expressions of denigration that can be considered antisemitic. It is possible that students may witness an antisemitic incident in their own communities or schools, read or hear about an incident in the news or on social media, or may even be a victim of antisemitism themselves, but may not understand the source or impact of the act— they may even think that such words or actions are “no big deal.” This material provides teachers and their students with an opportunity to explore the complex phenomenon of contemporary antisemitism as well as options to respond and take action to prevent it as they consider the importance of doing so. It is important that students have a clear understanding of the vocabulary used in these lessons. Teachers may decide to distribute the Key Words to each student for reference or point out where students can access the Glossary. Because antisemitism did not end after the Holocaust, teachers can help make this history relevant and meaningful to students’ own lives by connecting past events to the present through the exploration of antisemitism today. It is recommended that teachers introduce students to contemporary expressions of antisemitism after they have an understanding of the traditional forms of antisemitism that have existed for centuries. While this unit is specific to contemporary antisemitism, the material provides a springboard for discussion about prejudice and bias against other groups and the harm to individuals and society when such attitudes go unchecked. Students should be encouraged to discuss the role and responsibility of individuals to recognize and interrupt bias no matter what group is being targeted. In advance of discussing the topics covered in this unit, teachers should think about whether they have any students in their class who are Jewish. Some students might feel relieved to discuss a topic that is relevant to their lives while others might feel awkward or embarrassed. This does not mean that teachers should not discuss the topic; however, be careful not to point out who is Jewish or put specific students on the spot to speak for Jewish people or about antisemitism. Consider talking with the students or their families in advance. This unit provides an opportunity for students to understand that antisemitism did not end after the Holocaust. Students will learn about the persistence of antisemitism worldwide and analyze the different types of contemporary antisemitism that are present in society today. These include classical to newer forms of antisemitism as well as new forms based on old ideas. In addition, students will be introduced to individuals who refuse to be bystanders to antisemitism as they consider the responsibility of all members of society to respond to and prevent antisemitism and all forms of bigotry. Explain how contemporary manifestations of antisemitism are both different and the same as traditional forms of antisemitism that were present before and during the Holocaust. Identify levels of antisemitic attitudes around the world by exploring an interactive map and survey data. Identify examples of contemporary antisemitism and the tools that are used to spread its images and messages. Distinguish between legitimate criticism of Israel and criticism that is antisemitic. Describe, interpret, and reflect upon the content and messages in clips of visual history testimony and apply knowledge to produce new insights and perspectives on various topics. Identify ways to actively respond to and prevent antisemitism and other forms of prejudice. 1 Begin this lesson by helping students develop a framework for learning about contemporary antisemitism by defining the term “antisemitism.” Display the definition of antisemitism and read and discuss together. 2 After reviewing the definition, have students share their thoughts about whether antisemitism is primarily a problem of the past or if they think it is also a concern today. Invite students to share examples of antisemitism that they are aware of in their own communities or on a national and/or international level. If students have ever encountered or witnessed words or actions that they would describe as antisemitic, have them explain what happened and how they and/or others responded. 3 Display the photo of antisemitic graffiti and ask students to describe what they see and share their thoughts about the image and its message. Ask students if they are surprised at how recently this act of vandalism took place and whether the incident fits the definition of antisemitism and why. 4 Using the various examples discussed, elicit students’ thoughts on whether they think the antisemitism of today is the same or different from the antisemitism expressed during the Holocaust. This index is one source of data about the depth and breadth of antisemitic attitudes around the world. In May 2014, the Anti-Defamation League (ADL) released the results from its worldwide survey of 53,100 adults in 101 counties countries plus the West Bank and Gaza to measure the level and intensity of anti-Jewish sentiment across the world. The ADL Global 100 Index scores for each country and region represent the percentage of respondents who answered “probably true” to six or more of 11 negative stereotypes about Jews. An 11-question index has been used by ADL as a key metric in measuring antisemitic attitudes in the United States for the last 50 years. For more information about where and how the survey was conducted, including a list of the 11 questions used, visit the “About” section of the ADL Global 100 survey. What is the first thing you notice when you look at this map? What conclusions can you make about antisemitism today from looking at this map? What questions do you have after looking at this map? 7 Assign students to go the ADL Global 100 website on their own or in pairs and explore the “Did You Know” section. Distribute the Antisemitism Today: Interpreting Data handout and instruct students to answer the questions. Remind students to click on the links on the webpage, which provide important details. 8 After reviewing some or all of the responses to the questions about the survey data, tell students they will now watch two clips of testimony from individuals who experienced antisemitism after the Holocaust. After introducing students to [L]Felix Sparks[/L] and [L]Marta Wise[/L], show the two clips of testimony. What are some possible reasons why both Felix and Marta believe it is important to speak about their experiences during the Holocaust? 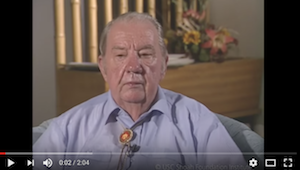 What is the value of hearing from both a survivor and a liberator? Why is Holocaust denial a form of antisemitism? What do you learn from Marta’s testimony about how Holocaust denial is spread and perpetuated? What evidence does Felix provide in his testimony that refutes the claims of Holocaust deniers? Why do you think Felix feels so strongly about combating Holocaust denial? Why do you think that Marta says it’s important for young people to hear survivor accounts? Soon there will no longer be any direct eyewitnesses to the Holocaust alive to share their stories. What effect, if any, will this have on those who say the Holocaust didn’t happen or try to minimize it? 10 Prepare students to read the Introduction to Contemporary Antisemitism handout by reviewing key terms and phrases as necessary. Distribute the text and have students study it as a whole group, in small groups, or individually. 11 After reading the handout, conduct a discussion with students using some or all of the questions below. Why is antisemitism referred to as “the longest hatred”? How did antisemitism change after the Holocaust? What reasons were given for the change? In what ways is contemporary antisemitism different from earlier forms of antisemitism that you have studied? According to the text, what are some classic themes and stereotypes about Jews that continue today? What does the term “new antisemitism” mean? What examples of contemporary antisemitism were discussed in the text? What are some of the ways that antisemitism is spread today? Why do you think these methods might be difficult to counter or combat? List three things you learned about contemporary antisemitism by participating in this lesson. Identify one question you still have about contemporary antisemitism. 2 In addition to words, encourage students to consider how images that we see around us (e.g., magazine covers, posters, advertisements) can influence our perceptions and opinions. Have students share examples of images that they have seen across a variety of outlets (including social media) that they believe are either positive or negative. 3 Have students consider whether in a world where words and images can be conveyed to a large number of people easily and quickly through various media and social networks, if there is a greater responsibility than was needed in the past for people to be cautious with the messages and images they promote. 4 Before moving on to manifestations of contemporary antisemitism, remind students of the antisemitic words and images they studied when learning about propaganda used in Nazi Germany and how it affected the people who saw it (e.g., Esther Clifford’s memories of seeing antisemitic posters on her way to school shared in Antisemitism unit). 5 Explain to students that in this lesson they will look at how antisemitism manifests itself today and in order to understand the words and images they will study, they need to understand the primary ways that antisemitism is expressed. Display and review Types of Antisemitism. 6 Explain to students that one of the complexities of contemporary antisemitism is that there is often a conflation of ideas centered around the denial and distortion of the Holocaust and opposition to Israel—sometimes its policies and sometimes its right to exist at all. Ask students to share what they know about Israel and what have been their sources of information. As a framework to help understand this issue, review and distribute When Does Criticism of Israel Become Antisemitism handout with students. 7 Distribute A Brief History of Israel and review together. Explain that this information will provide the necessary background information about the history and development of Israel and the context to understand some of the examples of contemporary antisemitism they will be asked to analyze. 8 Print and distribute the Antisemitic Words and Images: Past and Present handout. Review the directions at the top of the handout with the class. In small groups, have students read the statements and study the images and then answer the questions that follow. 9 Remind students that examples of antisemitism can be found in the news today and that individuals in the United States and around the world are feeling its impact. Before sharing and discussing the examples below, ask students to consider whether antisemitism is an issue that affects Jewish people only or if it is a broader matter that should concern everyone. 10 Distribute the Examples of Contemporary Antisemitism handout to students. Read the first example and then follow with the videos and discussion questions below. Have students share both their reactions to the video as well as any questions they have about what they just watched. What message does it send the world when Prime Minister Helle Thorning-Schmidt, the leader of Denmark, makes a statement to the international press about a crime in her country? What do you think Prime Minister Thorning-Schmidt meant when she said, “Collectively and united we will remain who we are”? In the “Countering Anti-Semitism in Denmark” video, describe the range of responses that Mette Bentow and her daughter Hannah received after the shooting at the synagogue. How does Niddal El Jabri, leader of the Copenhagen Peace Ring, react to the shooting and what does he do in response? Do you agree with his message of optimism, that things can be made better? Why or why not? 11 Read the second example and have students look closely at the photos. Follow with a discussion using the questions below. What specific words and images in this example cross the line between legitimate criticism of Israel and antisemitism? In what ways does this example meet the definition of the “new antisemitism”? 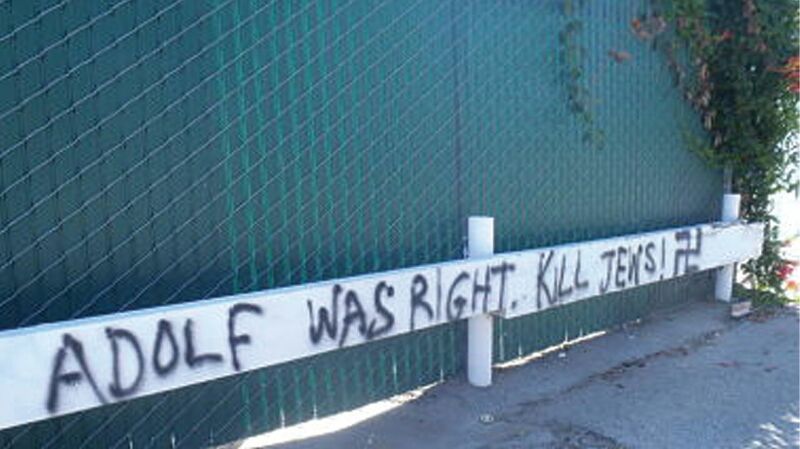 Who is hurt by such a display of hateful messages and images? 12 Read the third example and conduct a discussion using the questions below. What is a “hate crime”? Do you think that “hate crimes” should carry stiffer sentences than other crimes? Why or why not? In your opinion, why do you think that the judge made a statement to Miller during the sentencing hearing and what was he trying to say? How was Judge Ryan’s statement similar to what Prime Minister Thorning-Schmidt said after her country faced violent antisemitic acts? 13 To close this part of the lesson, circle back to the question posed earlier and have students consider whether they think antisemitism is an issue that affects Jewish people only or if it is a broader matter that concerns everyone. Encourage them to support their position with examples from the material they have just studied. 2 Have students share what they think Elie Wiesel meant by this statement and how his sentiment might relate to antisemitism today. 3 To begin the conversation about what can be done to stand up to antisemitism, have students consider why it is important for individuals and communities to speak out against this and all forms of prejudice and bias. What are the benefits to a society when individuals and institutions speak out against unfairness? What are the costs to a society that allows bias and prejudice to go unchecked and uninterrupted? 4 Help bring the discussion to the individual level by asking students what exactly we mean by “society.” Who comprises a society? If we are all part of the society in which we live, what is the role and responsibility of individuals to be vigilant about how people are treated and to speak out when they see injustice? Ask students whether they think individuals have the capacity to make a difference through their words and actions at home, in school, in the community, and beyond. 5 Share with students that ordinary people can inspire others to create positive change. While some actions require moral courage; many only require personal motivation, time, and energy. Tell students that they will be introduced to three young people who, through their words and actions, are confronting antisemitism. What experiences did Siavosh have growing up that helped motivate him to start the group Young People Against Anti-Semitism and Xenophobia? What risks do you think Siavosh has to deal with as the leader of his organization? Who was Raoul Wallenberg? What is the significance of Siavosh receiving an award named after Raoul Wallenberg? 7 Have a volunteer read the profile of Izzy Lenga aloud. Follow by having students share their initial reactions to the actions that Izzy decided to take when she witnessed antisemitism. Continue the discussion using the questions below. Why do you think people post hateful posters and messages on social media, like those that Izzy describes? What are their possible motivations? Do you think that the anonymity of social media allows people to come “out of the shadows” and express their racist and antisemitic beliefs in a way that would be much harder to do face to face? Does it help or hurt to know that these attitudes exist? Explain your thinking. What is your opinion about the way in which Izzy responded to the antisemitic tweets she received? Do you think you would have handled this situation differently? If so, explain how you might have responded. 8 Prior to reading the next profile, ask students if they have ever heard of the “BDS Movement,” and if so, what do they understand it to be. Explain to students that the BDS Movement is a campaign to support the Palestinian cause by calling on the international community to impose boycotts and implement divestment efforts against Israel. Explain that some supporters of BDS may genuinely believe that these efforts will encourage Israel to change policies with which they disagree; however, the predominant drive of the campaign and its leadership is not criticism of Israel’s policies; but an attempt to delegitimize, punish, or isolate Israel unfairly and seek to place the entire onus of the conflict on one side. For more information, distribute The BDS Movement handout or use it as a reference. 9 Have a volunteer read the profile of Leora Eisenberg aloud. Follow with a discussion about the work Leora is doing using the questions below. Describing the protesters’ rhetoric, Leora says, “Their protest in the name of “free speech” went against the free marketplace of ideas that an educational institution should stand for and seek to enshrine.” Do you think that free speech can go too far? How do we balance the right to free speech with the harmful impact it can have on individuals and groups? Leora uses a variety of platforms to share her ideas about antisemitism—blogs, articles, and social media. What role does each of these play in both promoting as well as combating antisemitism and other forms of hatred? When referring to social media, Leora advises, “Be eloquent and use it as a platform to say something important.” What do you think Leora means when she says “be eloquent”? 10 After reading and discussing all three profiles, have students think about what the word “activist” means to them and whether they think Siavosh, Izzy, and Leora are activists, and explain why or why not. Encourage students to share information about activists that they are aware of in their communities. 11 Remind students that there are many ways for individuals to become involved in standing up to antisemitism and other forms of prejudice and hatred today. Elicit from students ideas that they may have, including joining and becoming involved with various organizations. 12 Review the meaning of the term “bystander” from the Glossary. Have students think about whether or not being a bystander is a choice people make. Ask students why they think the individuals that they have learned about so far in this lesson chose NOT to be bystanders? 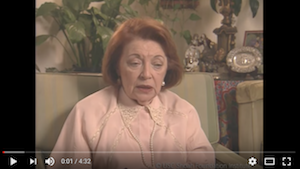 13 Tell students that they will now watch two clips of testimony from Holocaust survivors. Encourage students to think about what survivors like [L]Barbara Fischman Traub[/L] and [L]Henry Oertelt[/L] teach us about prejudice, antisemitism, and the dangers of being a bystander as they watch the testimonies. What specific examples does Barbara share about how she and her family were treated prior to the ghetto period? Contrast to how they were treated when the Jews of Sighet were rounded up and marched to the ghetto. Barbara says that her neighbors “peeked through the windows and turned their faces.” Does this behavior surprise you? In your study about the Holocaust, did you learn about other people who demonstrated similar reactions to seeing their neighbors forced from their homes? What were some of the reasons why people stood by and watched what was happening and did not speak up? How does Barbara remember feeling when her neighbors “turned their faces”? How did her feelings about the event change with time? What message does silence send to individuals who are being targeted by antisemitism and other forms of hate and bias? What can the Holocaust teach us about the impact that bystanders can have on society when individuals or groups are being targeted? Henry says that he sees that some progress has been made, but not a lot, in terms of people learning to respect each other. As someone who survived the Holocaust, how do you think Henry might feel saying that there has been little progress? What does Henry say we need to learn to do in order to fight against prejudice and hatred? Think about your own school and community. Would you describe them as places where people respect each other? What kinds of things could be done to make progress in this area? 15 In this next section, inform students that they will be provided with a scenario that they will discuss in small groups. Distribute the Taking Action: Scenarios for Discussion handout and assign each group one of the scenarios to read and discuss using the questions provided. Today, the amount of antisemitic content and messages being spread across the world via the Internet continues to grow exponentially. A 2016 global report from the Australian- based Online Hate Prevention Institute, “Measuring the Hate: The State of Antisemitism in Social Media,” highlights that not enough is being done to combat antisemitism in social media. The report, based on tracking over 2,000 items of antisemitism posted over the last ten months, found that only 20% of the items were removed. What do you think is the responsibility of social media companies and media in general to monitor and remove antisemitic content and other forms of hatred and prejudice? What, if anything, do you think can be done so that individuals behave more respectfully and responsibly on these sites? How do we balance our Constitutional Right to free speech with the harm that what can only be described as hateful speech inflicts upon individuals, groups, and society in general? 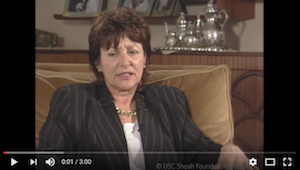 Search IWitness (iwitness.usc.edu) for testimonies from individuals who have stood up to antisemitism and other forms of bigotry in their communities. Reflect on the actions these people have taken, their motivations, and what we can learn from those who have chosen not to be bystanders. 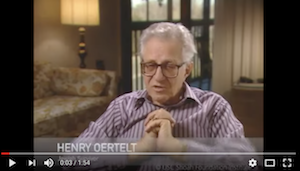 In his testimony Henry Oertelt says, “I am the prime example of what can happen to people that are suffering under prejudicial circumstances and biases…and we have to learn to speak up when we see prejudice and hatred.” Why do you think more people don’t speak up when they witness these types of behaviors? How have the individuals you have been introduced to in this unit, including Henry, helped you think about your role in your own community? 1 Data regarding antisemitic incidents and hate crimes in the United States are often routinely updated. Have students research current reports prepared and disseminated by organizations like the Anti-Defamation League (adl.org) and Southern Poverty Law Center (splc.org) to identify current trends and consider possible reasons for either the increase or decrease in such incidents. Findings can be presented in graphs that illustrate changes over time by state or region of the country. 2 Social media sites are replete with hate speech. Not only do original posts include antisemitic and other hateful words and images, but also the comment sections that follow such posts (as well as perfectly innocent posts) demonstrate the pervasiveness of the problem. Most major social media companies (e.g., Facebook, Twitter, YouTube) have policies regarding whether and what kind of hate speech are permitted, but these policies are often inconsistent, unevenly applied, and difficult to understand. Working in small groups, have students research how two or three social media sites monitor and regulate hate speech and hateful ideas, and decide whether they believe the policies in place are sufficient, and, if not, what else do they believe is needed to curtail hate speech in social media. 3 While much media attention is often given to antisemitic and other hateful acts, the efforts of individuals and communities to combat such acts are often less publicized. Have students research examples of communities and individuals who have taken a stand against hateful acts and present in a multimedia presentation.